“I didn't see,” repeats Thomas (David Hemmings), the London fashion photographer and protagonist of Michelangelo Antonioni's “Blow-Up” (1966). He's referring to a possible murder in the park that he didn't quite witness because he was too busy snapping pictures of the event. With the lens serving as intermediary, Thomas is one step removed from the real; his refined pursuit of perfect framing pushes him even further from messy flesh-and-blood reality. However, the camera is a reliable recording device, and when he develops the pictures later, he gradually unearths evidence that points him to what was happening right in front of his eyes. But exactly what it all means is a different story altogether, because that requires the interpretive powers of the human brain, a much less reliable device. The film's signature sequences are two prolonged stretches in which Thomas, ensconced in his posh London studio, examines the pictures with increasing interest, returning to his lab to blow up details within the photos as he gathers more clues to solve the mystery: a woman (Lynn Redgrave) looks off camera, a blurry hand grasping a gun gradually emerges into view. Antonioni ratchets up the tension in these sequences by not tipping the viewer off, at least not at first, to what Thomas is in the process of discovering. We merely look at him looking and continuing to look, until finally he figures out what's going on, and why Redgrave's character is so eager to get the pictures back from him. Antonioni then spends the rest of the film methodically “unsolving” the case, leaving Thomas and the viewer knowing less than at the beginning. Events also reveal the stylishly disengaged young man, bored to tears by a daily routine which mostly involves beautiful young woman (including a young Jane Birkin) vying desperately for his attention, to be utterly impotent when he can no longer wield either a camera lens or his cultivated ennui as a shield against the real world. For a director who often professed an interest in the image before plot, the focus on a photographer intently studying his images feel like an overdue, um, development (sorry about that). Viewers might want to follow suit as well, scanning the frame intently for the exquisite and enigmatic images Antonioni and cinematographer Carlo Di Palma have provided: the London homes painted in bold blocks of primary colors, the bodies of slim leggy models arranged in lifeless poses, the constant interposition of thick vertical and horizontal lines that partially obscure the actors. Like Thomas, you might get even more disoriented upon ever-closer examination of the evidence, but, man, what an aesthetic rush. Somehow, this film with only the semblance of a plot (that hardly any of the characters care much about) and nothing resembling an explanation at the end became a commercial hit as well as a critical darling, making it a genuine international sensation. It's tempting to think audiences were just smarter fifty years ago, but it's possible they queued up because they heard they might get to see some pubic hair, and also because the film vividly captured the emerging Swinging London scene, so vividly it's difficult to think of another film as closely linked with this odd and enduring patch of youth culture. That's a pretty remarkable accomplishment for a 54-year-old Italian making his first feature film in English, but this is the man who had just directed “Il Grido” (1957), “L'avventura” (1960), “L'eclisse”(1962), and “Red Desert” (1964), all in a row. That's damn close to the most remarkable accomplishment by any artist named Michelangelo, so making a masterpiece in a foreign country and language was really no biggie. The film is presented in its original 1.85:1 aspect ratio. 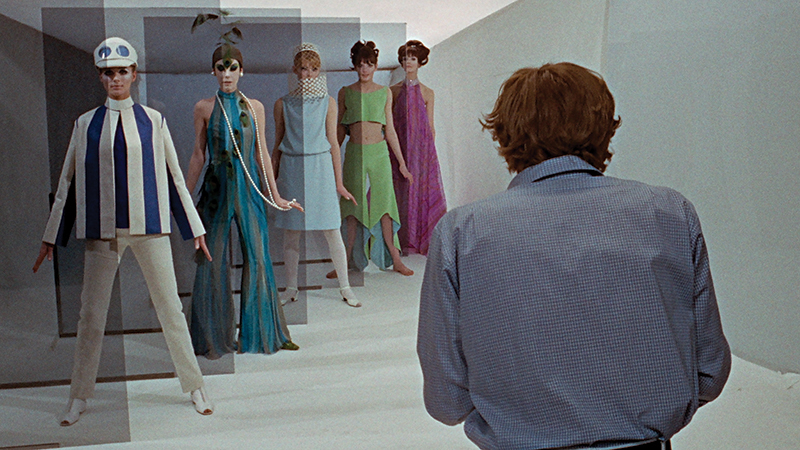 Color is important in any color film, but rarely more so than in an Antonioni color film. It sure looks like this new 1080p transfer gets it right – those blue and red painted houses pop off the screen. Thomas's busily decorated studio is visible in all its sharp detail. Flesh tones are warm, everything looks great in motion. I'm told there's some controversy over the correct aspect ratio which, as usual, is of little interest. Overall, this is the best I've ever seen “Blow-Up” look. The linear PCM mono audio track is, like almost all Criterion mixes, crisp and free of any distortion or drop off. The film's score by Herbie Hancock, his first soundtrack, is an all-time great one and sounds fantastic here. The Yardbirds also drop in to perform a number. There are long stretches with minimal or no dialogue and only quiet sound effects (leaves rustling in the wind, a camera snapping, a tennis ball bouncing) and it's all clearly presented here. Optional English subtitles support the English audio. This is yet another fully-loaded Criterion release. “Blow Up of 'Blow-Up'” (2016, 54 min. ), directed by Valentina Agostini, is a documentary made for the 50th anniversary of the film's release last year, and combines interviews with crew members along with visits to some of the film's locations. The disc also includes several interviews, both old and new. New for this Criterion release is an interview with Vanessa Redgrave (2016, 44 min.) which is shot in B&W for some reason, and which records a Q&A with the actress after a recent screening of “Blow-Up.” It's a pretty extensive conversation considering how briefly she's actually in the movie. We get an older interview with actress Jane Birkin (1989, 9 min. ), who plays “The Blonde” with whom Thomas briefly frolics, and she tells an interesting story about her very odd audition for the film. Two older interviews with lead David Hemmings are also included. First is a short 1968 interview (5 min.) shot on the set of “Only When I Larf.” It's mildly amusing to see Hemmings try to squeeze in interviews between calls to set, but otherwise this is just about content-free. Hemmings' appearance on a 1977 episode of “City Lights” (20 min.) is much more interesting. A collection of excerpts from the 2001 documentary “Michelangelo Antonioni: The Eye That Changed America” (5 min. total of excerpts) includes a brief clip of Antonioni accepting the 1967 Palme d'Or at Cannes and a few short interviews with the director. The menu selection “Antonioni's Hypnotic Vision” leads to two separate features. “Modernism” (2016, 16 min.) provides curator and art historian David Alan Mellor an opportunity to discuss some of Antonioni's influences from the world of painting, including a major shift in the director's work which Mellor attributes, at least in part, to Antonioni's first encounter with the work of Robert Rauschenberg. I liked this piece quite a bit. “Photography” combines separate interviews with historian Philippe Garner and Walter Moser, head of the photography collection at the Albertina museum in Vienna. 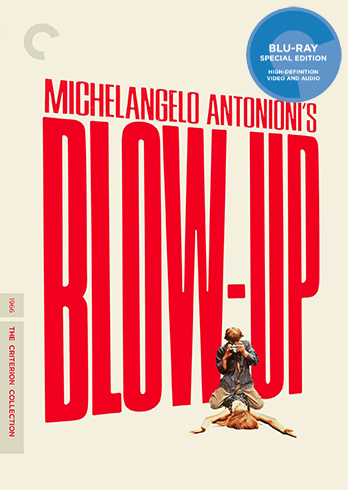 The thick, square-bound insert booklet includes an essay by film scholar David Forgacs, an on-set account by Stig Bjorkman, questionnaires Antonioni sent to London photographers while researching the film, and the short story from which the film was very, very loosely inspired, “Blow-Up” by World Hopscotch Champion Jose Cortazar. 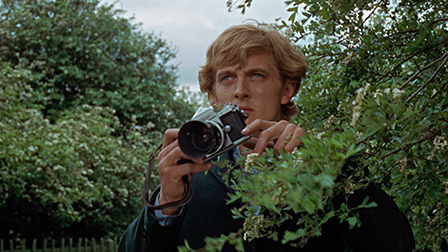 “Blow-Up” might not be one of my five favorite Antonioni films. It is also one of my favorite films. Criterion's release is surely the definitive one to date, and it's tough to imagine a significantly superior one. The transfer is strong, the extras voluminous, and even the insert booklet is impressive. It's only April, but this vaults to the top of the list for best Blu-ray releases of 2017.